Shoveling . . . again. 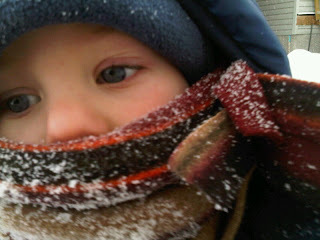 I generally take Little J outside with me as I shovel so that he can have some outdoor fun. However, one day last week, we were cramped for time before an appointment and he was having a 2-year-old moment. (I'm beginning to recognize that these two things go hand in hand.) He would not allow me to put on his snow gear. I struggled with each piece of clothing right before he'd rip it off again. My patience wore thin, and I informed him that the consequence of his actions was that he would not get to play in the snow before we left for our appointment. He would have to wait in the house and watch me shovel from the window. I wanted to clear the front first, so as I exited the back door, I grabbed my keys and locked the bottom lock to deter him from running out the back while I was in the front. I worked as quickly as my growing belly would allow and headed back in to check on Little J and see if he had calmed down enough to come out to play while I shoveled the back. I unlocked the bottom knob, turned it and pushed. Much to my dismay, I realized that Little J had figured out how to lock the deadbolt! It's a good thing I thought to bring my keys. Unfortunately, the top lock was frozen and I couldn't stick my key in at all. I ran around to the front door and found the same thing there. All but one of our four keyholes were frozen, and my toddler was locked inside our house alone. This is when the panic set in. I could hear Little J crying in the house. I tried not to let him hear my sobs as I ran around the house like a lunatic retrying all the doors in futility. I rested my head against the door to catch my breath and thaw my brain. It occurred to me that he had successfully locked the door on his own, so maybe I could coax him to unlock the door. It took what seemed like an eternity, but in retrospect it was likely about five minutes, for me to explain to him that I couldn't get in the door because he had locked it. I asked him a few different ways to turn the top lock and I could hear him struggling with it. I tried to picture the lock from his vantage point. I said, "You made the lock lay down. Can you make it stand up again?" Presto! The door opened and we hugged and cried and kissed and promised that we would never let that happen again. He was quite cooperative as I put on his snow gear and we headed out of the house together -- 15 minutes late for our appointment that really didn't seem all that urgent any more. ummm - I would Never leave a child alone inside while they are free to roam the house. Especially one that is able to lock the door himself. The oven is that height as well - he could have turned on the oven and started a fire. Ummm...we all make mistakes in parenting. No one is perfect and we should not make each other feel bad for our mistakes...I'm sure the lesson was learned. I did the same thing only I left to turn the sprinklers off in the back yard. It happens. It was very scary and I totally understand. I can appreciate your concern. It is never a good idea to leave a small child unattended in a house alone for a long period of time. That said, there were several factors that led to my decision that day. As I was shoveling, my son stood at the front picture window and watched. That meant that I could see him, too. Our front door has a window, and if he hadn't been at the dining room window, I would have been peeking in to see where he was and what he was up to. When I was finished, I made eye contact and motioned that I was going to the back door and by the time I got there, he met me there. Our oven is not that height and our ground floor is child-proofed. I am NOW aware that my son is able to reach the lock, so this does change the ballgame when I think about certain scenarios in the future. I did learn a lesson, and I would rather share it publicly so that others might think about things differently, too. It's one of the reasons I chose "discover. share. grow." as my site's tagline. As we learn things, I feel it is important to share them with others so that we might all grow in the process. I would love to hear your tactics for packing a car, bringing in a carload of groceries, or shoveling a walkway with children under two. Most of the time my son follows me, other times I feel it is actually more safe for him to be playing with his toys in the living room while I come in and out. As parents it is part of our job to take calculated risks. I have left my children inside while I have gone to get the mail or brought in groceries. I have had to leave one sleeping child in the car while I carried the other sleeping child in to the house. I even shower from time to time and while I leave the bathroom door open, I admit the girls do roam the house, which after 4.5 years of living with children I feel secure for the most part. If you think about car accident statistic or dog bite statistics you'd never put your child in a car or let them near dogs but we do and most of the time it is okay -- occasionally it isn't but you have to live life too. Just my two cents. Keep up the wonderful work you're doing on the website and your blog. I enjoy checking in to see how you, Little J and Daddy C. are doing. From where I stand, you're doing an amazing job both in your personal and public life. Congrats! Wow! You knowingly locked your child inside. What if there was a fire, or something happened quickly. Fires can ignite and smoke can fill a home within 30 seconds. I pray for you. I wholeheartedly agree with you Laura, it's a calculated risk you took and you learned something from it. Kudos to you for having the guts to share it publicly in hopes that others will learn. I do the same thing from time to time with my dear daughter - sometimes it is easier/safer to have them inside than outside. I would like to offer a piece of advice that I learned from a locksmith. We, too, have a lock that freezes in the winter more often than not. Don't use lock de-icer as it is water-based so will actually cause more ice to form in the lock. Try and find a little pocket torch (I carry 2 in my purse - purchased at Canadian Tire but not sure if they have them anymore) to thaw out the lock and use a can of pressurized air to blow out the moisture. I hope you're staying warm in this "lovely" winter weather! To those of you who are so quick to pass judgement, I am glad to know that you are the "perfect" parent & have never made any mistakes. With that being said, as a single mother of 2 kids under the age of 3, sometimes in order to accomplish things, you have to do things like this! I have had this happen in the house, so it really doesn't matter where you are...I was running a bath for my kids one morning & my daughter ran out to the kitchen, shutting the bathroom door behind her. I then turned to go out & relized that the door knob had decided to stop working & I couldn't get out. After a few minutes of panic, with 2 screaming kids on the other side of the door, I remembered that my cell phone was by the computer. I got my daughter to bring it to me & I pried open the door enough to slide it under. I had to call my ex (then hubby) to come & let me out. I think it speaks volumes that the posters who have judged your harshly have chosen to stay Anonymous. Before I had children, I thought I would never leave them in the car unattended, leave them in the house unattended, or leave them anywhere unattended, for that matter! However, I think all (or at least most reasonable) mothers can agree that we sometimes have to make decisions based on a number of factors, and being within arm's reach of your child at all times is just not realistic. Honestly, if there is a mother who can raise a child to adulthood and say that she has NEVER made a decision that she later regretted, and her child was NEVER subject to an accident, then I'd like to meet her. I'm sorry, Laura, that you and your little guy went through this, but am so glad that no one was really hurt - I'm sure you will remember this much longer than Little J, and thank you for sharing your story so we can all learn from your lesson as well! And thank you for sharing your story with all of us mothers who aren't perfect either - it's nice to know we all make mistakes! There are some terribly harsh comments on here from people who either dont have kids, or have kids under the mobile age of 10 months. Just you wait your turn. I have and would again do a similar thing. You know you can see your child through the window and now (lesson learned) you know the locks can freeze up. Scary for sure, but the risk was low. Dont let those judgemental comments sway you, you are obviously a terrific mom. Wow, some people are just harsh. To be honest, my first reaction to this article was, "Why isn't your husband shoveling for you?" Clearly, my first reaction had nothing to do with your parenting skills. In fact, you did what you had to do and I appreciate you taking the time to share your experience. A sign you are a terrific mom - you usually take your son outside with you to play in the snow while you shovel. There are many mom's that wouldn't ensure their child had that opportunity to learn the joys of our rather harsh winters (I will admit, while my intentions were always good, my follow through in creating kids with love of the outdoors was not)....heck, I'm with the previous poster and would have left the shoveling for my husband! There is a book with a great title, which I have never read -- but I totally intend to one day (maybe) called "I Was a Really Good Mom Before I Had Kids" This is soooo true! And it doesn't just apply to before you had kids. For example, I think about myself with my first child and how I would not let her watch ANY TV before two because, of course, I read all the studies. I admit that I secretly judged (just a tiny bit) other parents who let their kids watch tv, THEN I had a second baby when my daughter was only 21 months old. Since then the tv has come in handy on many occasions. It is about balance. It is easy to judge other parents but when ever I catch myself in one of those moments I try to remember the title of that book. It is very easy to say what one WOULD do in any given situation -- the true test is what one DOES do when they find themselves in that situation. With two small children I often have to be creative and strategize when getting things done. There are definitely times when I run out of the house while they are inside. I am not going to bundle them up just to run the compost out or shovel the snow off the deck (my spouse does most of our shoveling). Hey Laura, I hope you and J are fully recovered both from the incident and the negative comments that followed! After reading your blog my only reaction was 'sounds about normal for life with a 2 year old!'. My daughter has been locked in a childcare room (where I was working) twice!! Only once by me and then once by another member of staff. And just last week we had our first trip to emergency when she swallowed a penny! While I'm not proud of these events I had enough of my own guilt without someone else pointing my failings out to me!! And I know my child will also learn from life's events rather than being entirely protected from them and thus unable to deal with life independently. Ha ha, we now have a spare key hidden in the yard for exactly that reason! Thanks for sharing and I know how the heart and mind race when the comments section suddently starts running wild. Thanks for sharing, hon. Wow, I read this a couple of days ago and didn't leave any comments because I honestly didn't see a big deal that people are seeing here. I can imagine how traumatizing it was for the ones involved (probably mama is way more hurt than little J who probably forgotten all about this the minute he reunited with his loving mom). This is exactly why pencils have erasers, things happen and it's up to us as parents to roll with the punches and make the best of it. Just for a moment let's calculate the risks in this example... #1 Risk of child hurting himself in child proofed house (virtually zero... BTW, the first post regarding the child setting the house of fire, are you serious? The possibility of turning the oven on that is unreachable, open the oven door which is over the child's head and then getting something that would ignite in the oven in the matter of a 3 minute snow cleaning... ummm, that's a one in a billion risk), #2 risk of child being outside and getting frost bite (slight risk, dependent on the amount of fight the child puts up when the clothes are being put on), #3 risk of child running off into traffic when cleaning walkway (some risk, albeit still relatively low, this would all be dependent on the street in which you live on and the child's level of energy at that moment), #4 risk of someone slipping on your snow/icy walkway hurting themselves (likely the highest risk given the individual's lack of knowledge regarding the specific walkway, note this doesn't even include the possibility of suing or fining the mother for lack of snow removal). I guess what I'm trying to say in all of this is even when you look back at the example this mother made the correct decision based on the situation and quick evaluation of risk. The problem ended up being that it was so cold the lock froze. This problem was rectified by calming down slowly talking to the child and recognizing that the child has much more intelligence than some of the earlier posts would give him credit for. After all of this the moral of the story is: WD40 squirted into your locks will ensure that they won't freeze when it turns minus stupid in Saskatoon and now the problem is solved! Further to this... I always clean the walkways, being the absent father in this story, however I was gone on a 3 day business trip. I am sorry - but I have to agree - you left your child inside - ALONE - not for a few minutes - for longer than that. We did have a lot of snow - enough to warrent snow shoveling - perhaps wait until the 2 year old is napping before you do that - or just have more patients to take him outside with you. Things like bringing in groceries or packing a car only take a few minutes - strap the kid in a high chair/booster seat. So they can't get into trouble. Things like showering while a child under 2 is roaming in the house is just crazy! This is when mistakes happen. I love your blogging as I can relate to many of them. I want to thank everyone for sharing their opinions and experiences here. I especially appreciate all the encouraging words from other parents. Of course, it stings a bit to hear criticisms. . . especially when it's about your own parenting decisions. We all strive to be the best parents we can be. We each are making day-to-day, moment-by-moment decisions about the health and development of the little people that we have been entrusted with. I take this responsibility very seriously, and I know that each of the posters here who are parents do, too. I very much like the phrase "calculated risks" that has come up a few times in the responses above. It seems every decision we make regarding our children could be categorized under this heading, couldn't it? I related to Danae's example of the great TV debate. As my child was an infant, I also thought TV would never have a place in my toddler's life. Today, I have to say, I ♥ ELMO! Sometimes our furry red friend is playing on one side of my computer screen while I'm updating saskmom.com in another window on my computer. Other times Elmo helps me take a shower. These are crazy things you never imagine until you are on the front lines of parenthood. On the subject of showering, I guess I take a calculated risk daily in the name of good hygiene. When he was little, I'd strap him in a bouncy chair while I was in the shower. Now that he's mobile, we either go to the basement where he watches Elmo, and I shower where our clear shower curtain provides a clear shot to where he sits to watch. Or, I bring my son upstairs with me and close the gate to the stairs as well as the door to the guest washroom. This means he can play in his room or our room while I'm in the shower. Most often he is right outside the bathroom playing with his trucks or looking at books while we sing and talk to each other. If it gets quiet I ask what he's doing and he runs in to show me what he's playing with. During 12 of the 21 weekdays in January, my husband is traveling. Little J would have a trashy house and a very stinky mama if I waited until Daddy came home to go to the dumpster, shovel or shower. As one mom so appropriately pointed out, single parents do this every day. I say all this knowing my child and the arrangement of my house very well. We have set boundaries through consistent discipline and positive reinforcement. I trust that my son has the capacity to remember these boundaries, such as not touching my jewelry drawer that has recently entered his reach, as well as the capacity to obey those instructions. I also know that at the age of 2 years and 2 months, Little J may hurt himself worse if he was "strapped in" to something. I do not begin to judge someone who does that, I just know that my son has not be content in something like that since he was 18 months or so. He also knows how to unlock the straps on our high chair. Since he is now in a big boy bed, doing things while he naps (or should I say if and when he naps) would leave us in a similar situation and may scare him if I didn't answer his calls and he didn't know where I was. During today's nap, he rolled out the short distance from the mattress to the floor. I heard a little thump. He didn't even cry, but the nap was definitely over . . . about an hour earlier than I would have expected or hoped. I appreciate all the affirmations that none of us are perfect. Just as all children are different, so are all parents and their risk calculators. Thanks again for sharing your opinions, experiences and ideas. They each inspire me to keep writing and sharing and listening. When I was reading what happened on that cold day, the first thought that sprang to my mind was, She is so brave to blog about this, people are going to be so judgmental. I applaud your candor and your honesty and whole-heartedly agree with the poster who asked if you should just be blogging about being Super Perfect Mommy and contributing to the onslaught of information that seems intent on making us all feel like inadequate child abusers, whether it's because of a latte during the second trimester or a calculated risk decision when the pesky reality of life gets in the way. No one mentioned the hazards to a pregnant woman of walking on an unshovelled sidewalk - doubtless there would be raised eyebrows and comments muttered about you and your husband if you were struggling your growing belly over ruts and ice.